Blue Origin's privately built New Shepard passenger ship launches on a suborbtial test flight from West Texas on April 29, 2015. New Shepard is a commercial spaceship designed to fly at least three people on round trip suborbital flights. A longer, 6-minute video of the New Shepard's launch shows the vehicle rising into the blue Texas sky, with the passenger capsule separating from its booster and parachuting back to Earth. The two videos released by Blue Origin did not show the descent of the rocket booster — dubbed the "propulsion module"— which is designed to make a vertical landing and be reused on future flights. In his statement, Bezos confirmed that the rocket booster was lost during the test. "Of course one of our goals is reusability, and unfortunately we didn't get to recover the propulsion module because we lost pressure in our hydraulic system on descent," Bezos wrote. "Fortunately, we've already been in work for some time on an improved hydraulic system. Also, assembly of propulsion module serial numbers 2 and 3 is already underway — we'll be ready to fly again soon." Wednesday's New Shepard test flight reached a maximum altitude of 58 miles (93 kilometers) — just a few miles short of the 62-mile-high (100 km) boundary between Earth and space. The demonstration flight occurred just weeks after Blue Origin President Rob Meyerson announced that test flights would begin this year. "They could go as quickly, in the early days, as on a monthly schedule — a month between tests," Meyerson said during the April 7 announcement. "But we expect over the next couple of years to be flying regularly with the New Shepard vehicle." This view from Blue Origin's New Shepard spacecraft shows the separation from its propulsion module during an April 29, 2015 test flight over West Texas. 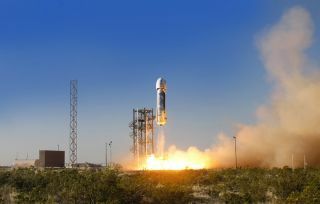 Blue Origin has been quietly developing reusable rocket engines and spacecraft to launch paying passengers into space. The New Shepard spacecraft is designed to launch at least three people — and possibly more, depending on other payload — on round trips to suborbital space. It is powered by Blue Origin's BE-3 rocket engine, which generates 110,000 pounds of thrust and is fueled by liquid hydrogen and liquid oxygen. While the company has not released any pricing details for its passenger flights, Bezos did unveil an online sign-up portal for potential customers in Wednesday's announcement. According to that portal, a full capsule could carry six people into space. Blue Origin's New Shepard spacecraft returns to Earth under parachutes during a suborbital launch test flight from West Texas on April 29, 2015. In his statement, Bezos added that Blue Origin has also already begun design work on a larger, orbital spacecraft that it calls the Very Big Brother to New Shepard. "We continue to be very big fans of the vertical takeoff , vertical landing (VTVL) architecture," Bezos wrote. "We chose VTVL because it's scalable to very large size." The Very Big Brother is "an orbital launch vehicle that is many times New Shepard's size," according to Bezos. It will be powered by the company's more powerful BE-4 rocket engine.